Ensure the security of both personnel and product according to HACCP and OSHA© standards. Eliminate design flaws and inefficiencies that hinder work flow and allow dangerous physical and food safety conditions. This reduces injury claims, lost-time and minimizes food-borne illness throughout the lifetime of the establishment. Food-service tasks involve a lot of walking. The physical locations of essential areas need to complement each other. A mere six feet of misplacement can equal miles of extra walking every day and interfere with other operations. A six foot correction can equal about seven hundred miles per year, saving 45k to 55k year over year. These savings can be realized in other areas too; receiving and storage, service areas, dining rooms, walk-in coolers and freezers. Locating these optimally could have an exponential impact of 100k or more annually. Optimizing square footage has a real financial benefit as well as reducing personnel movement. Design for loss prevention by locating service doors, storage rooms and the manager’s office in areas of least disruption and prominent view. Using only one equipment supply company is convenient and often includes a “free” CAD layout. But be careful, these up-front savings have exponential backend costs. The equipment and layout are so important to long-term financial success, that a subject matter expert will pay it back in spades. Utilize a buyer who shops at several supply companies to avoid the latest and greatest. Opt instead for tried and true. Nothing is really free, and you generally get what you pay for. Consider the economic and safety costs a poor layout can cause; see safety and ergonomics above. The “free” layout produced in the backroom of the equipment supply company is often CAD 101, and simply fits the equipment into the space. Typically, architects and general contractors aren’t involved with the hook-ups. A sub-contractor completes the installation. However, after equipment and layout issues, chefs’ complain the most about utility connections. Numerous lines connect the water, electric, gas and drains to all the various equipment. Rarely are they out of the way, durable, adjustable, serviceable or cleanable. The cords, pipes and drains themselves need to be cleaned, maintained and serviced. A food-service authority highlights operational criteria. Receiving and storing product, cooking, cleaning, serving, managing and auditing, culminate in the understanding of what maximizes safety and efficiency. 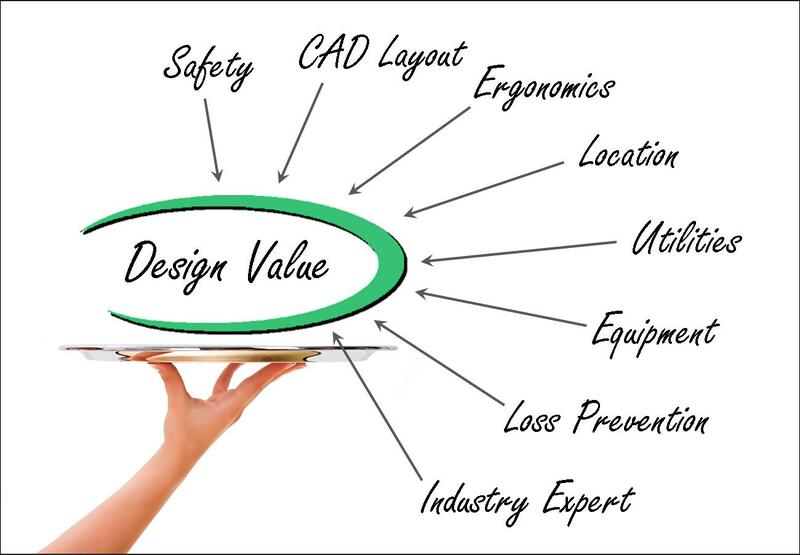 Utilizing an expert in these specific areas has a guaranteed return on investment and ensures the long-term financial success of your design.